https://www.cincyticket.com/eventperformances.asp?evt=3546 Tickets on Sale Now ! Daddy-o Grande from Los Straitjackets has been diagnosed with multiple myeloma(cancer of the bone marrow) profits from this show will go to Daddy-O Grande for his ongoing medical expenses. Admission is free but donations to Daddy-O-Grande are strongly encouraged! Bring your friends, family, lawn chairs and a cooler(Non Alcoholic drinks only). 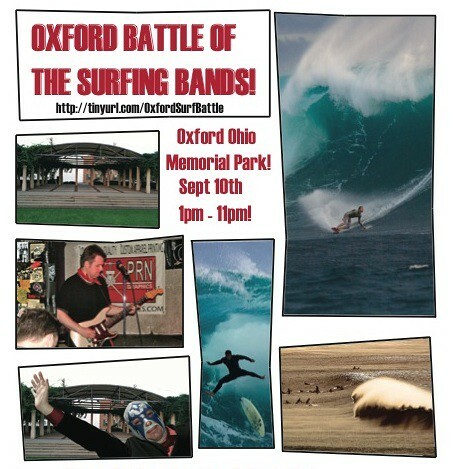 Have a seat on the lawn and hear some of the best surf music in the midwest! If the weather is warm bring a bathings suit & towel for the kids to play in the fountain! Show starts at 1pm and ends between 11pm! Check out these 10 Amazing Surf Bands! All of the bands with asterisks beside their names had special requests for these times. These were because of other commitments or the fact that artists playing in more than one band wanted them to play back to back. Our next rehearsal is Saturday. This will be our second with Jim. Hope we can come up with some new promotinals and demos. We have over 30 tunes now with Jim. RIGHT BEFORE THEIR DEBUT ENGAGEMENT IN EDEN PARK the surf rock band also known as "Don't Fear The Reverb" lost their bass player, Dan Nolan, to the great abyss. So now we are searching for a new dedicated bass man or bass and guitar man to fill the shoes. Ever since I (Don Schott) joined this band I have been bubbleing over with new spirit and enthusiasm. This mostly because after playing bass for 40 years I am now the rhythm guitarist. I feel renewed; like I am 15 again. I can play all the bass lines but not while I am playing guitar too. So we need another bass player or another guitar player that can play the bass lines. Are you the one? Make sure to check the Calendar Dates section to get the latest info on performers. Also check the EVENTS section to get more info than what shows up here on the home page. Rick Lisak trio is now a Quartet named "the Sloes"
Band schedules are almost completed. New news is that the Cincinnati Park Board has decided to "pitch in" and be a Co-Sponsor" - isn't that cool? More new sponsors are coming on board and I will write about it as soon as I have a Moment-- Oh, the poster to copy is in the photos section as well as right below this copy. As soon as I can finish their web pages I will resurect the Association of Performing and Recording Artists which is a 501-C-3 non profit organization founded in 1988. Back in December of last year on the 10th & 11th, I recorded live performances of a quartet (Friday) and a Quintet (Saturday) featuring ART GORE (past drummer for George Benson and now living in Cincinnati), Jim Anderson (bass), Jim Connerley (piano), Brent Gallaher (tenor & soprano sax), and on Saturday Pat Harbison (trumpet). Guest drummers were Bobby Scott, Melvin Broach & Anthony Lee. It was fantastic. We landed some wonderful tracks and I am in the process of mixing them now on a Panasonic DA7 digital mixer. Don Schott will travel anywhere for a good recording. I started recording at age 13 in 1964 and have always had an interest in production. Mostly I work within 100 miles of Cincinnati. I have over 25 years experience working professionally in recording the live performance and on location/field recordings. I am equiped for multi channel recording and have recorded the Cincinnati Symphony Orchestra and the Cincinnati Chamber Orchestra for broadcast on WGUC and NPR. EYE RECORDS is the label where many projects I produce find their listening audience. Started in 1980 when vinyl was still the king medium, EYE is recognized as a place for diverse interests in music and DVD.